Big 5 Casino will then reward you with a bonus (Welcome Bonus is for new players only). The terms and conditions of the bonuses vary between different casinos and might also change over time and between different countries, so it is important to compare the different offers and read the T&C for Big 5 Casino before signing up. Get ready to meet five of the most colourful African safari animals with Big 5 Casino. This cartoon-styled website takes you on a wild adventure to a beautiful Savannah as you spin the reels. However, this isn’t like any other casino. Honesty and trust is the main focus of attention which is why there are unique wagering conditions on all bonuses. Payment solutions are also fast and straightforward, while customer support is high-class. But, don’t worry. They haven’t forgotten about the games and there’s a huge selection on show from the world’s best developers. Take a read of our review to find out more! There are a great range of software developers that contribute to the site. 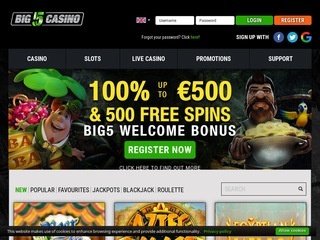 They include worldwide giants Microgaming and NetEnt, plus others such as Betsoft, iSoftBet, TAIN, and Quickspin. The diverse selection means there are many different types of games that you will love playing. While slot games are the most prominent on the site, there’s also a selection of table games and a live casino to keep you occupied. Games can be searched by category where you can find New, Popular, Favourites, or providers. Alternatively, you can use the search bar if you know specifically what you’re looking for. As have mentioned, slots are the most extensive part of the casino, and new titles will rub shoulders with old classics. Popular hits include Aloha Cluster Pays, Diamond Wild, Big Bad Wolf, Neon Reels, and Shaolin Spin. Head over to the Jackpots section if you fancy increasing your entertainment value. There’s not a huge amount of games – just five in total – but you will be able to find hits such as Mega Moolah, Jackpot Rango, Basic Instinct, and Rambo. These games will also give you the best chance of winning millions of pounds. 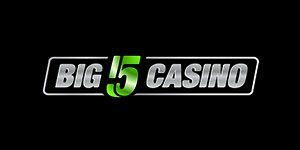 If you’re a table game enthusiast, you will be pleased to know there are 33 available to play at Big 5 Casino. There’s a huge range of blackjack and roulette tables. However, you will also find baccarat and poker options such as Texas Hold’Em and Oasis Poker. There’s also a decent selection of video poker games on hand, such as Joker Poker, Tens or Better, and Aces and Faces. Big 5 Casino doesn’t just have the usual slots and table games on offer though. There are also other titles such as bingo, virtual racing, keno, and many more. You can also check out the Scratch Cards section where you will be able to find an incredible 31 games of this variety. The live casino offers even more titles for table game lovers. NetEnt and Extreme Live Gaming are the main providers and they both have separate studios broadcasting their hits. This section allows for a real authentic casino atmosphere, and you can even interact with dealers and fellow gamers. Plus, there are stake sizes ranging from pennies to thousands of pounds so it will suit every type of player. It’s easy to deposit funds into Big 5 Casino because there are a number of methods available. These include Skrill, Neteller, iDeal, Sofort, Visa, MasterCard, Euteller, DotPay, Trustly, and many more. The minimum you can deposit is £20 and there is no maximum limit. All deposits are free of charge and you can even set yourself limits for safer gaming. In terms of withdrawals, the minimum is £20 and the maximum is £1,000 per week or £5,000 per month. There is a 48-hour pending time before any transactions are processed. This will give you an opportunity to change your mind and cancel your request, however, this isn’t always a good thing. You may also have to prove your identity before withdrawing for the first time. Check out the terms and conditions on the website for more information regarding banking methods. You will be able to get in touch with the customer support team at Big 5 Casino through a number of methods. The live chat option is probably the easiest and fastest as you will get a response within seconds. However, you can also use the contact form or send them an email directly. The agents are only available between the hours of 12:00 and 00:00 so bear this in mind. Alternatively, you could check out the FAQ section which will provide useful answers to common questions. Languages accepted on the site include English, German, Norwegian, Swedish, and Finnish. Plus, you can even follow the casino on several social media platforms, including Instagram, YouTube, Twitter, Facebook, and Google +. This will allow you to keep up to date with news and information, and also directly message them from your account.